Home > Events > Politics Summer School! Enroll Today! Politics Summer School! Enroll Today! 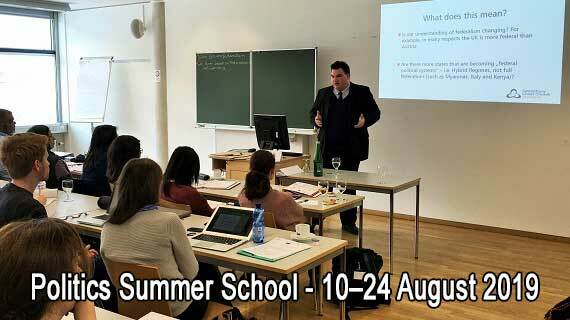 The Politics Summer School is jointly organised by Canterbury Christ Church University’s (CCCU) Politics and International Relations programme and the Centre for European Studies (CEFEUS) at CCCU. This year’s event will take place from 10–24 August 2019 in Canterbury, Kent. We invite applications from undergraduate and postgraduate students, professionals, and those interested in federal studies, the European Union, institutional design in divided societies, conflict resolution and the link between federalism and good governance in different parts of the world. The topic of this year’s Summer School is “Federalism, Conflict Resolution, and Good Governance”. Participants will be introduced to different theories of federalism, its use in different countries around the world, the ways in which federalism and other forms of territorial autonomy can help mitigate conflict, and how federalism can contribute to good governance and democratization. Lecturers include leading international academics, who have years of experience in their subject and have often been involved in policy advice as well. In addition to an interesting and challenging academic programme, students will be offered with an inspiring social programme, which includes a pub quiz on federalism and a guided tour of the wonderful city of Canterbury! The programme also includes a visit to London and the Houses of Parliament!